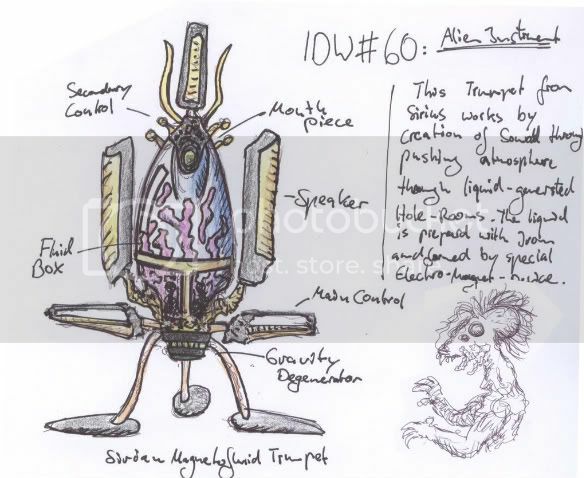 Background: Topic speaks for itself: design and draw up an alien instrument that looks like nothing you've seen before or since. It produces a sound no human that has never heard it can imagine exists. Whether you draw just one instrument or a whole orchesta of them is up to you. Description of your concept is required this time though! 1. Design and draw one or more Alien Instruments! 2. Add a description to your concept! Entries without it will not be taken to poll! first idea. hoping of enough time to do a piece of this instrument with more details and better lineart, if nothing better appears. Altered-mind: I don't think it says it has to be tech anywhere...industrial design encompasses a whole lot more than 'tech'. This is probably my only contribution to this round unfortunately. Just something that showed up on my sketchbook page as I was pointedly not studying for (4!!!) exams. (Fie upon examinations, FIE! I say ) meh. fughi from yuggoth: I would pick up a ruler and do some nice line art. Most of the pieces of your instrument are different lengths, different shapes and at different levels on your page and it looks a tad messy. Description: the Xayyeho is an ancient instrument used by the Lapsi. It is used since ancient time to call; not other members of the tribe though, but nature. The special sound generated by this instrument seems to affect plants and animals around the musician, in a way that resembles communication. Although it´s not an articulated form of communiation, the Lapsi can stimulate plants to grow faster or slower, cause flowers to move (away or towards the instrument), call animals or make them run away, and many more things that grant them a strong bond with the nature of their planet. The instrument is a mask, made with leader, dead animals, bolts, and a plant called Xay. This plant is the main thing behind the instrument, as it is it´s sound that, seems to create this bond with the nature. Hi, I'm new here. I'm an architecture student and I'd love to jump into one of these design competitions. I missed this one but I'll try to get into the next one! Apologies for being a little late with the finals thread, been a bit busy with stuff lately. Also, seeing as there aren't all that many entries for this round (yet) I'll put up the finals thread and let it run for another day or so. i had made some further sketches,maybe i'll draw sumthin together now. in germany it's testing time at the universities. Anyway I wanted to show some loving here. I did this the night before for here. From the outside the Cilian Flata design is slightly similar to the double flute designs made by humanoids. History points out that the Cellian Flata is ancient compared to human instruments though but far more advanced. What makes this instrument unique is it can only be played by alien species that have four hands and two mouths. Trying to play the instrument with just one mouth and two hands results in atrocious sounds that are simply unbearable to hear. However when played correctly the two corresponding barrels of the instrument create beautiful harmonic sounds. Last edited by Trashy; January 27th, 2009 at 02:34 AM. gimme 5 hours!! b\w is finished, colour will follow. 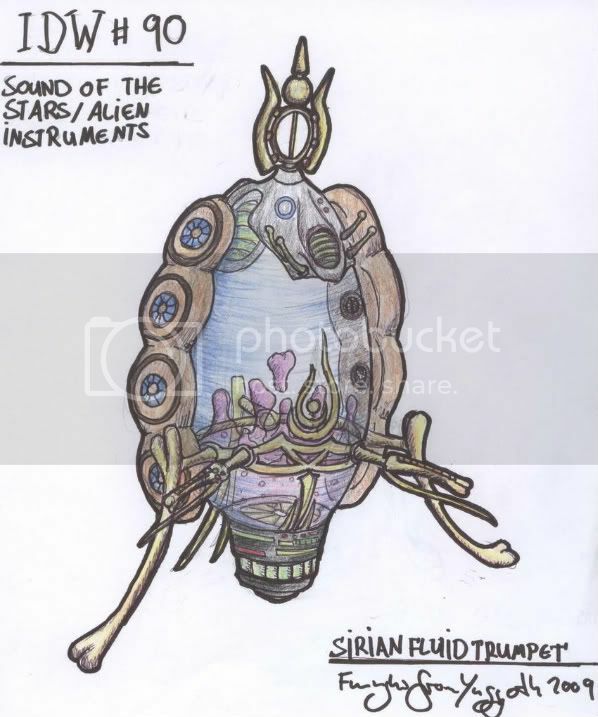 The Sirian Fluid Trumpet is a brass instrument; and within it's egg shaped resonance body there is an amount of magnetic fluid, which can be rearragend by a huge electromagnet at the bottom. Within the movement of the fluid in the main cavern, the airwaves follow different paths through the resonance body and the outcoming noise is controlled. around the 90° latitude there are several speakers with microphones which take the sound out of the cavern and sing beautiful serenates from the stars. At least, if you have 4 mandibles to control the mouth the piece. Last edited by yoitisi; January 28th, 2009 at 11:47 AM.